George IV commissioned Rundell & Bridge to make the diadem in 1820 at a cost of £8,216. The fee included a hire charge of £800 for the diamonds but there is no evidence they were ever returned to the jewellers. George IV wore the diadem over his velvet cap of maintenance in the procession to his coronation at Westminster Abbey. These are the equivalent of £600,000 and £60,000 in 2016, respectively. The gold and silver frame, measuring 7.5 centimetres (3.0 in) tall and 19 centimetres (7.5 in) in diameter, is decorated with 1,333 diamonds weighing a total of 320 carats (64 g), including a four-carat yellow diamond in the front cross pattée. Along the base are two strings of pearls. Originally, the upper string had 86 pearls and the lower 94, but they were changed to 81 and 88 in 1902. Instead of the heraldic fleurs-de-lis usually seen on British crowns, the diadem has four bouquets of roses, thistles and shamrocks, the floral symbols of England, Scotland and Ireland respectively, alternating with four crosses pattée around the top of its base. It has been worn by every queen and queen consort from Queen Adelaide, the wife of William IV, onwards. 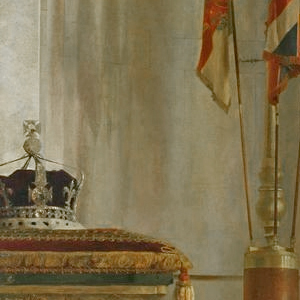 The diadem was reset with jewels from the royal collection for Queen Victoria. Queen Elizabeth II wore the diadem in the procession to her coronation in 1953, and she also wears it in the procession to and from the annual State Opening of Parliament. When not in use, the diadem is on display in the Queen's Gallery at Buckingham Palace. The iconic piece of jewellery has featured in many portraits of the Queen, including one painted by Lucian Freud in 2001 and one by Raphael Maklouf in 1984 that appears on Commonwealth coinage. Arnold Machin designed an earlier portrait in the 1960s that was used on coins and the Machin series of postage stamps in the UK. The diadem has also featured on the banknotes of most Commonwealth realms, and those of Anguilla, Bermuda, British Guyana, British Honduras, British Virgin Islands, Cyprus, Dominica, Fiji, Hong Kong, Malaya, Malta, Mauritius, North Borneo, Rhodesia and Nyasaland, Saba, Southern Rhodesia, St Kitts and Nevis and Trinidad and Tobago. ^ Ronald Allison; Sarah Riddell (1991). The Royal Encyclopedia. Macmillan Press. p. 173. ISBN 978-0-333-53810-4. ^ The Journal of Gemmology. 23. Gemmological Association of Great Britain. 1992. p. 41. ^ Edward Francis Twining (1960). 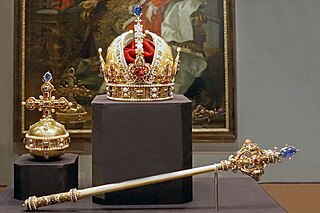 A History of the Crown Jewels of Europe. B. T. Batsford. p. 169. ^ Paul D. Van Wie (1999). Image, History and Politics: The Coinage of Modern Europe. University Press of America. pp. 63–64. ISBN 978-0-7618-1222-7. ^ Sophie McConnell (1991). Metropolitan Jewelry. New York: Metropolitan Museum of Art. p. 56. ISBN 978-0-87099-616-0. ^ Don Coolican (1986). Tribute to Her Majesty. Windward/Scott. p. 273. ISBN 978-0-7112-0437-9. ^ Jerrold M. Packard (1981). The Queen & Her Court: A Guide to the British Monarchy Today. Scribner. p. 162. ISBN 978-0-684-16796-1. ^ The Royal Household (25 May 2003). "50 facts about The Queen's Coronation". The Official Website of the British Monarchy. Archived from the original on 9 February 2012. ^ "The Queen: Portraits of a Monarch - Lucian Freud". Royal Collection Trust. Retrieved 29 December 2015. ^ Country Life. 196. 2002. p. 161. "The Diamond Diadem". Royal Collection Trust. Inventory no. 31702.